KAMPALA– When Katoko came back from her garden work, she found her baby with high fever, sweating and shaking with chills, not breathing well. With her dirty feet, she tied the baby on her back and reached for the only means of transport at home; the bicycle and pedalled furiously for 8Km. But on reaching the nearest health centre III in Kaderuna in Kibuuku district, her relief quickly turned to despair when the nurse on duty announced that the baby was dead. “Your baby had pneumonia and you rode her through the cold weather not covered well thereby complicating her situation, she could have died along the way,” the nurse reportedly told Ms Katoko. Katoko said the nurse reminded her about failure to take the baby for vaccination when the government announced mass immunisation against killer diseases; pneumonia, diphtheria, polio, tetanus, tuberculosis, measles, and whooping cough. Although today Vaccination, especially that of babies, is a religiously followed routine in most Ugandan families, there are still people like Katoko who don’t bother to take their children for vaccination. According to the nurse, Katoko’s baby did not take Pneumococcal Conjugate Vaccine (PCV), which would have saved her from pneumonia. Katoko is not alone, there are many families in rural areas, Sub-urban and hard to reach areas in mountainous places across the country that have not had their children vaccinated, putting the children’s lives children at risk. Although vaccination is very important as it is, it is often made difficult by conflicting information, influences from organisations, cults and lately access to services in Uganda. Pneumonia is the leading killer disease in Uganda, according to the March 2017 Uganda demographic and health survey, the respiratory system disease kills thousands every year. Dr Julian Abeso, a pediatrician at Mbale regional referral says Pneumonia, diarrhoea, measles, Tetanus, diphtheria, polio, tuberculosis, and whooping cough and malnutrition are the primary killers of children in Uganda and the rest of the developing world. “Failure to access routine immunisation or health services, lack of sufficient vitamin A and other essential micronutrients in their diets, allow pathogens (disease-causing organisms) to thrive,” said Dr Abeso. She explained that the possibility that children will become seriously ill or die depends largely on whether their immune systems can fight off infections and that the irony is that all these diseases are preventable and could be avoided through immunisation. She said in Uganda the under-five mortality rate is high, with pneumonia responsible for approximately 16 percent of deaths. Dr. Keith Klugman, Director (Pneumonia), Bill & Melinda Gates Foundation says although infant mortality due to pneumonia fell by 47 percent between 2000 and 2015 – from 1.7 million deaths a year to 920,000 – pneumonia caused 16 percent of all deaths among children under 5 in 2016 alone. “Despite progress in combating pneumonia in the last few decades, one aspect has remained consistent: the fact that it exists as a disease of poverty, so now is the time to double-down on our collective efforts to end it,” said Dr Klugman. According to a report by UNICEF during the launch of free Pneumonia vaccine In Uganda, Pneumonia disease kills up to 24,000 children under the age of five years every year and that most deaths occurring as a result of pneumonia happen in rural and poor communities. Pneumonia is an acute infection of the lungs, it is caused by a bacterial infection, but it can also be caused by a virus, fungus, or parasite and presents symptoms like cough, flu, fever, difficulty in breathing; signs that may be mistaken for malaria. The ministry of Health records show that Pneumonia, which annually kills 24,000 children under 5 years (representing 21 percent of mortality), occupies top slot among pneumococcal disease. Dr James Ditai of Sanyu Africa Research Institute [Safri] says although vaccines have greatly reduced the prevalence of diseases and continue to be important for global health today, there is need to adapt to new innovations in order to save the children. He explained that understanding what works in different settings and sharing lessons and experiences is essential for improving immunisation systems and health delivery in Uganda. He revealed that although the World Health Organisation (WHO) introduced Reaching Every District (RED), the Ministry of Health needs to constantly remind themselves that every year starts with a new cohort, maintaining consistency good performance is essential to protect all children, including those in the future. “And reaching every child, not just those living in some poor performing districts, should be a national priority,” said Dr Ditai. Dr Sabrina Kitaka while appearing on NBS Television on September 14 also urged the ministry to, besides immunisation of every child, adapt to new technology if the country is to get rid of pneumonia and other child killer diseases. She emphasized making improvements in disease prevention and treatment accessible to all people in Uganda, with a focus on access to oxygen therapy, a treatment for severe pneumonia. “Pneumonia is a preventable and curable disease in industrialised countries, but it remains deadly in some developing countries, so we need to make oxygen accessible to all because the number of children who need it is overwhelming, “Dr Kitaka said. The Lancet, Global health has made a call for countries to adapt to new innovations to defeat childhood pneumonia;” innovations to transform pneumonia diagnosis and treatment are urgently needed to tackle the leading cause of death in children younger than 5 years of age,” reads a report by The Lancet, 2013. The Lancet advises that there is need to adapt to a Bubble-Continuous Positive Airway Pressure (BCPAP): A robust, easy to use device that delivers oxygen to sick children at a fraction of the cost of mechanical ventilators through an oxygen cannular, intravenous tubing and a shampoo bottle – with gas flow provided by oxygen concentrators. Dr Jonathan Wangisi, a former project director for operational research at The Aids Support Organisation (TASO) says that the Children’s Automated Respiration Monitor (ChARM): An easy-to-use, automated breathing rate monitor to support the diagnosis of childhood pneumonia by community health workers in developing countries should also be adopted to. 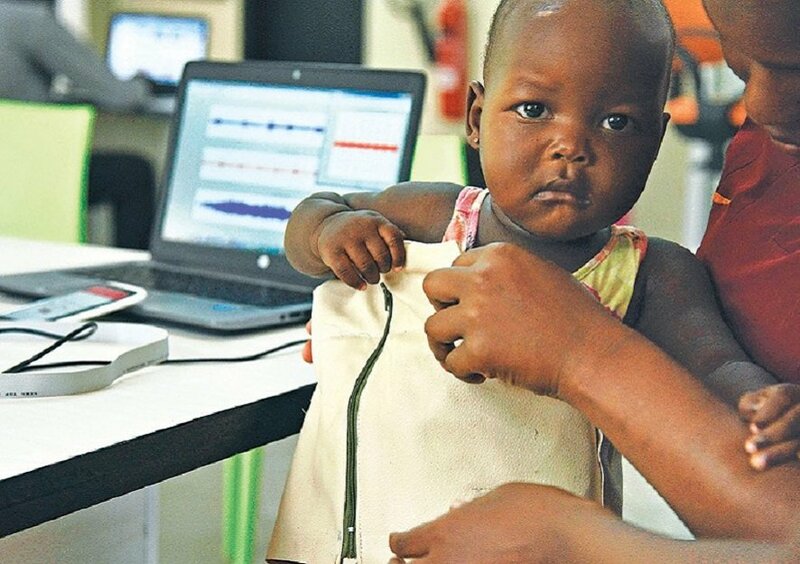 “ChARM is placed around the child’s belly and automatically measures the respiratory rate and classifies fast breathing according to the WHO guidelines and the device will also be able to measure temperature and oxygen levels,” said Dr Wangisi. He revealed other innovations in the fight against Pneumonia as Low pressure oxygen storage [LPOS], PneumoFone; an app that converts a smart phone to an instrument for pneumonia diagnosis without extra sensors or an external communication network, based on the analysis of cough sounds and Oil-Based Amoxicillin Suspension, a suspension of amoxicillin in non-volatile oils eliminating the use of water for reconstitution during treatment of childhood pneumonia. The Minister Of State for Health (General Duties), Hon. Sarah Opendi, said her ministry has adapted the use of supportive supervision as an innovative means to improve immunisation services. She explained that the ministry is also encouraging and identifying good practices and accelerating learning to improve performance through smaller round-table discussions, promising and innovative ideas into successful, widespread, institutionalised practice. She revealed that in order to fully address child pneumonia in all settings, the government has recommended a balanced and comprehensive approach that accentuates other preventive strategies, as well as vaccines. “And listed among these is good nutrition and breastfeeding, reduction in indoor air pollution, hand washing and improved case management,” said Ms Opendi. She revealed that the ministry has recommended that besides immunisation with the Pneumococcal Conjugate Vaccine (PCV13)), at primary level, there must be; Education about warning signs of Pneumonia, Education on good hygiene practices to prevent Pneumonia (washing hands, covering month when coughing, adequate nutrition, drinking safe water, decrease exposure to environment factors). President Museveni in 2013 while speaking at the launch of the Pneumococcal Conjugate Vaccine meant to cut pneumonia deaths among children below five years called upon parents to immunise their children against killer diseases. He advised parents to take their children for regular checkups and routine immunisation and urged government to train health officials on better ways of managing the disease. The WHO and partners recommend that there is need to highlight the importance of immunisation, and the remaining gaps in global coverage, underscoring the value of vaccines to countries and the importance of investing in immunisation efforts. -Immunisation prevents illness, disability and death from vaccine-preventable diseases including cervical cancer, diphtheria, hepatitis B, measles, mumps, pertussis (whooping cough), pneumonia, polio, rotavirus diarrhoea, rubella and tetanus. -Global vaccination coverage remains at 85%, with little significant changes during the past few years. -An additional 1.5 million deaths could be avoided if global immunisation coverage improves.